… but Mary kept all these things in her heart and thought about them often. The heavenly glow provides top lighting in this scene. Jesus & his mother Mary. Originally I was going to show Mary with a “thought bubble” above her head, showing all the things she was pondering: the birth of her baby, Joseph her husband, their journey from Nazareth in Galilee to Bethlehem, the manger, the shepherds, etc. But that seemed a little too cartoon-like! 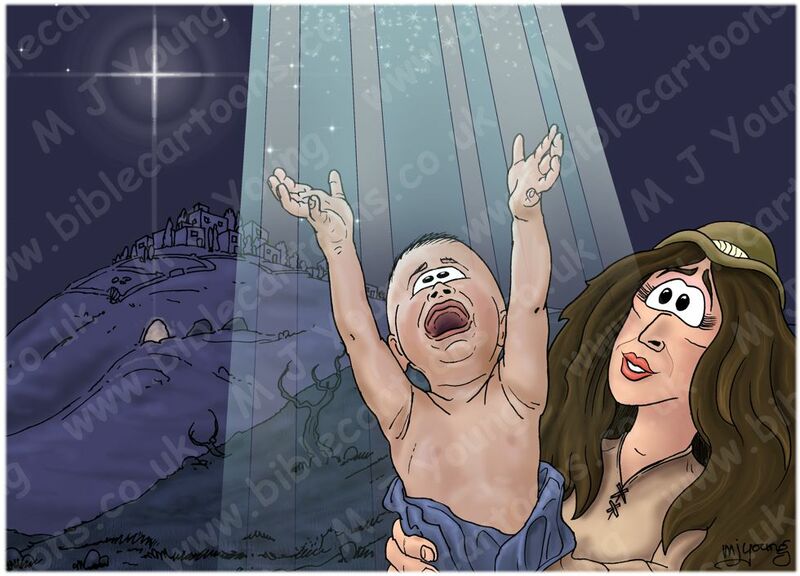 So I have settled on a close-up of Mary & the baby Jesus, with the scene of the star, cave & Bethlehem in the background. The blue glow, light rays & sparkles from above is simply a visual representation of the connection between the infant Jesus & heaven: the Father, Son & Holy Spirit in perfect communion. I like the fact that the baby Jesus is laughing & reaching up towards the light of heaven. I expect only Jesus in the scene can actually see the light. 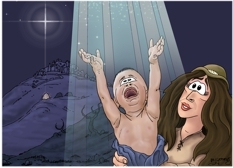 I searched for a photograph of a mother & baby on the internet, & as soon as I found one with the baby reaching up, I thought of this idea; divine inspiration comes to Bible Cartoons once more! I really like the way this picture has come out. The intimacy between Mary & Jesus, & the intimacy between the baby & heaven is lovely.